Off duty, Scott was known to savor the experience of fine scotch whisky, a traditional Earth beverage. 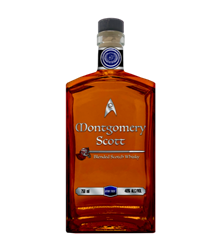 Montgomery Scott Scotch is the latest product in a line of Star Trek branded spirits launched this year by Silver Screen Bottling Co. The blended scotch whisky is available for pre-sale for $49.99 beginning November 28 and will begin shipping in March 2019. Visit http://www.MontgomeryScottScotch.com to preorder product now.